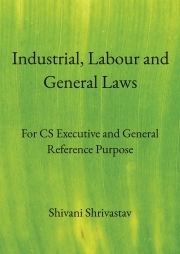 Description of "Industrial, Labour and General Laws"
This is a book made as a ready referencer to help people get a basic understanding of various Industrial, Labour and General Laws. This is specially beneficial for CS students as well as those who require the basics of these Acts in a short sitting. This book outlines the major concepts of each statute, giving you a brief understanding about the procedures and compliances required under each Act. Shivani Shrivastav is a CS who has been into teaching and writing for the past 16 years. She has authored various books on Corporate, Economic, Industrial and other General Laws. Several more works are in process. Reviews of "Industrial, Labour and General Laws"